Colon cancer remains the second-leading cause of cancer-related death in Canada. My late wife, Wendy, was committed to raising awareness about colon cancer. In 2001, she lost her courageous battle with this disease. As a spokesperson for Colon Cancer Canada for many years, I recently appeared in a media campaign to educate the public on the importance of early screening and detection. While there are screening options, the colonoscopy continues to be the gold standard test to prevent colorectal cancer. As such, this highly sophisticated type of testing can truly save lives. 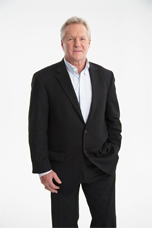 To view a pdf of Colon Cancer Canada�s ad featuring Darryl Sittler, click here. In 2001, Wendy Sittler lost her battle with colon cancer. Late wife of hockey legend Darryl Sittler, Wendy was instrumental in assisting with raising awareness and funds for Colon Cancer Canada. She wanted to ensure that anyone diagnosed with cancer would have the necessary supports to help them manage their life with this disease. In her memory the Wendy Bear was created, of which all sales go directly to support people living with colon cancer. To purchase a Wendy Bear, click here. To learn more about Colon Cancer Canada and its important work across the country visit www.coloncancercanada.ca.